We’re about to head into two months of absolute royal mania – with a royal baby and a royal wedding — and hyper-vigilant palace fans have spied something interesting afoot. The excitement is focused squarely on the steps and frontage of the Lindo Ward at St Mary’s Hospital in London. This is the very same hospital that Duchess Kate gave birth to Prince George (born on 22 July 2013) and Princess Charlotte (born on 2 May 2015) at. 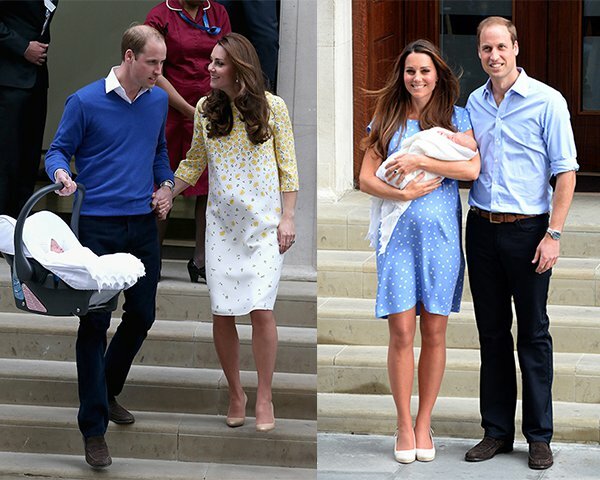 In fact, they are the very same steps that Prince William and Kate introduced their first two newborns to the world. And honestly, those cute minutes when this family snuggled their fresh babies for our entertainment were pretty gosh-darned adorable. We would be lying if we said we weren’t busting to see this all play out again! “So what’s all the fuss about the steps?” we hear you ask. Well, it’s just been pointed out that the frontage of the hospital, including those famous newborn-friendly steps, has been given a fresh lick of paint and a general tidy-up. It’s being suggested that St Mary’s Hospital is now in “nesting” mode, preparing to put its best foot forward and face the world’s media when the newest addition to the royal family makes his or her appearance. Charlotte ignored the signs and came in her own good time, on the 2 May. The palace announced this new addition to Kate and William’s family back in September 2017. The baby is due very soon, although the official date is vaguely described as “April”. William joked last week that Kate was due to deliver “any minute now” at a recent engagement, perhaps commenting more on the advanced state of her pregnancy, size of her bump and the challenges that come with that, rather than her actual due date. We’re (totally) guessing the birth is expected in three weeks or so. That said babies arrive in their own good time, but we think St Mary’s is making plans – and wielding paintbrushes – based on Kate’s own “late April” due date admission. Of course, this is all quite well-informed speculation. It has not actually been confirmed that Kate will deliver at St Mary’s as yet, but royal watchers are convinced this lick of paint is a sign – and almost definitely confirmation – that this is the case. When it comes to baby names, the couple are expected to continue with their favoured traditional theme. When Kate goes into labour, it’s expected that the press will excitedly assemble at St Mary’s like a pack of hungry wolves. Once the baby is born, the official announcement will come via the royal social media accounts – Kensington Palace and The Royal Family – as well as the brand new Royal Baby hub on the Royal family’s website. We very much look forward to clapping eyes on the newest member of this growing family, especially now that we know the steps are sparkling!